The Mystery of Life | NJNA is Blogging! This is my second geometric with Sue Reed, and it is a beauty. The original color way is red and green and gold, very rich and medieval-looking. At first I was a little taken aback at my colors…not the colors themselves, but where they were placed in the design. Somehow I had it in my mind that my purple would take the place of the red in the original, but in fact it is the lime green that takes center stage, with purple as an accent. 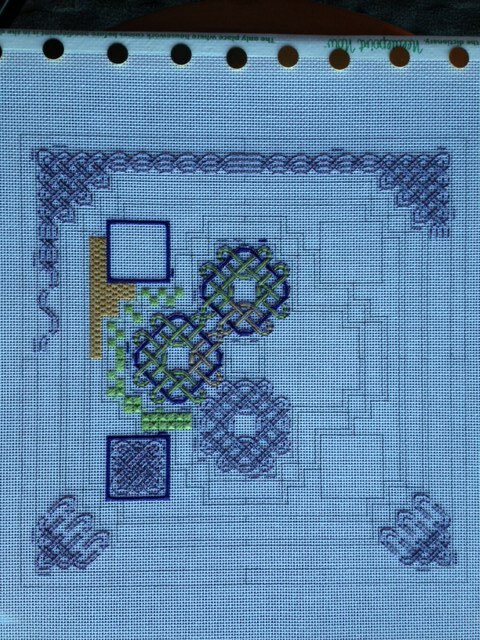 As I stitched, though, I liked it more and more. We have some options in laying in the color in the knots, and so I think I will be able to make the piece emphasize the purple a little more in the end. Sue Reed is a wonderful teacher, and one learns a tremendous amount from her in a class. She does a great job of showing how to improve our stitching by paying attention to details that we might not even think of on our own.